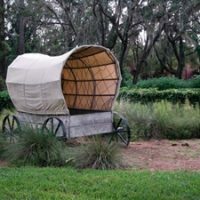 Have you ever played the Oregon Trail computer game? This fun activity places players in the mid-1800s when the gold rush began. Immigrants who lived on the East Coast of the U.S. suddenly began migrating to the far west in California in search of riches and a better life. 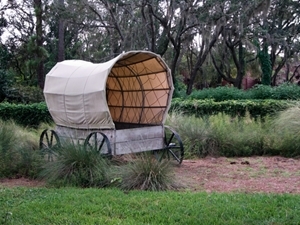 Families picked up their meager belongings and crossed the entire country in covered wagons, fighting off diseases and hunting and gathering what they could along the way. Kids love learning about this time because being in the wild sounds like a lot of fun. Encourage your kids to build their own version of a wagon and spend their time "traveling" and talking about what they see and game they eat. They can play the game, "If I had a million dollars" but as, "If I had a lot of gold," imagining what people at this time would want to buy and why they left their homes. During the Revolutionary War, Paul Revere rode toward Old North Church in Boston's North End, alerting the sexton that two lanterns meant the British were coming by sea. The English troops were heading for the Americans, and without that historic two-lantern signal, the Revolutionary War may have been lost. Turn your living room into Boston Commons, with the Old North Church on one side and the Charles River on the other. After telling the church custodian to light two lanterns, alerting the troops, Paul Revere crossed the Charles in a rowboat to tell patriots in Charleston of the incoming raid. Don tri-corner hats and long cloaks before enacting this historical moment! If your kids are learning about Civil Rights, hosting your own march on Washington may be a meaningful way to help them gain knowledge about Martin Luther King. This important event happened on August 28, 1963. Students often see clips of the march with 250,000 people rallying the streets of Washington, D.C., in search of jobs and freedom in the time of racism. People marched on the Washington Mall, carrying signs about their need for jobs and justice. The walk ended after Martin Luther King's "I Have a Dream" speech. Have your kids create their own picket signs after thinking about what they would say if they were being treated unjustly because of their race. Then, march through the house or yard. One child should play Martin Luther King, reciting his speech for your whole family to hear. Partaking in your on version of this incredible moment and putting themselves in the shoes of people at the time may prove an incredible learning experience for your kids.